This addendum is mostly a compilation of common-sense items. Most "dog people" would follow these without even thinking about it. However, we have discovered with human rentals, to take nothing for granted. (For instance, it never occurred to me to leave a note saying, "If you spill coffee all over the kitchen cabinets, please clean it up." But lo and behold, somebody did spill coffee everywhere and didn't clean it up, and all the cabinets are stained beyond redemption and have to be repainted!) We don't want to scare anyone off- this is a fabulous place for dogs and their humans (Jackie adores it here and caring for him here is a breeze), but we'd rather err on the side of giving too much information and advice versus not telling you everything we can possibly imagine! So, we've compiled this list especially for those bringing the 4-legged family member. 1. Piddle Pads / Incontinence: If your dog uses piddle pads or is incontinent, this rental is not for you. In the course of three months, we had to replace all the rugs in the rental three times! If your dog damages a rug/carpet and/or rug pad, you agree to pay all additional costs to replace (or clean if possible) the rug/carpet and/or rug pad. 2. A note about fleas: You may want to discuss your current flea prevention with your veterinarian and tell him or her that you are vacationing at North Topsail Beach, North Carolina, and get professional advice for your dog. 3. Leash: Please keep your dog on a leash around town. a) We want to be good neighbors, and while most people adore dogs, there are some folks that are scared to death of them, and even your friendly, lovable, wouldn't-hurt-a-fly canine can be frightening to those folks, b) Please don't leave the dog in the yard unattended-Please keep an eye on him/her when they are out there playing or what have you---please don't leave them in the yard alone whilst you go out. c) There are gentlemen from the landscaping firm that come in to the yard to take care of the garden and yard. You never know when they might be there, so keeping an eye on the dog in the yard helps avoid unexpected encounters (but the yard men/lady are very very nice). 4. Waste: Please clean up after your dog, whether you are in the yard or on a walk. We provide plenty of blue doggie waste bags in small plastic capsules that fit right in your pocket for your use while you are here. The yard is mostly pine straw, pretty grass, and flowerbeds. Obviously, please keep the dog out of the flowerbeds, but dogs seem to take to both defecating and urinating in the pine straw or grass very well. It is also easy to clean up that way. You should always put out the accumulated pile of used blue bags for the trash man the night before he is due in another garbage bad in the trash container. Anyway, the schedule for trash pick-up is in the kitchen in Idyll-by-the-Sea Two. (By the way, there are plenty of White Hefty Cinch Garbage Bags under the kitchen sink. You should place any used blue bags in one of the larger white trash bags before leaving them out for trash pick-up.) The garbage can is located on the side of the house. In all cases you must clean up after your dog in the yard and on walks. Please don't abuse the privilege of being able to bring your dog with you. We know how much this can mean to folks, and we really want to be able to keep this going. If the next guest complains of dog waste in the yard, it will be very hard to keep this privilege going. 5. Puppy Sheets / Protecting Furniture: If your dog is enough a member of the family to come on vacation, there is a very good chance that he or she likes to sleep in bed with you or get up on the furniture to nap. (I think most dogs find a favorite soft spot to snooze away the days while the humans in their lives work to in order to buy them dog bones and take them on vacation.) All we ask is that you thoroughly cover any and all areas of any beds and furniture that the dog likes to sleep or nap on with a "puppy sheet." We define a puppy sheet as an old blanket or sheet that is perfect to protect furniture and easy to shake out and wash frequently. There is a large pile of puppy sheets in the second floor laundry for this use. (We have discovered here that if we brush Jackie more frequently and really shake, wash, or whatever is appropriate, the sand out of his fur, it keeps the house much cleaner.) There are two different kinds of upright vacuums in the laundry room, a Dust Buster, and small and large brooms, should you need to get up any sand (from human and dog) as your vacation progresses. There are also outside wash/showers with hoses to clean up after the beach for two and four legged visitors--We also provide basket full of marked "puppy towels" for your use after washing or hosing off the pup. 7. Dog Fee: There is a non-refundable $75 per dog per stay dog fee. 8. Barking: Everyone here is on vacation, so please don't let your dog bark constantly and annoy anyone. We all want to be good neighbors. 9. Yard Time: Please keep the waste cleaned up during your stay. 10. Spa Suite: Sorry, pets are not allowed to use any of the facilities of the fourth floor Spa Suite with you (sauna, steam shower, etc) out of concern for your pet's health (overheating, etc). 11. Dogs on the Beach: As per the town of North Topsail Beach "Dogs must be on a leash and under the control of the owner at all times. ... It is the owner’s responsibility to ensure that all excrement is immediately removed and placed in the proper receptacle. ... 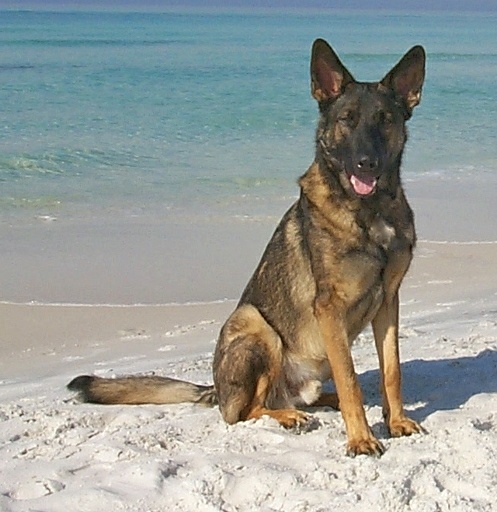 Please make the beach enjoyable for all - both people and your pets!" 12. Washing your Dog: If you need to wash your dog, please do so outside. It is not appropriate to wash your dog inside the house. Thanks for your patience with all of our detailed items. We truly want everyone to relax and enjoy their vacations- 2 and 4 legged! We often find it helps to have questions answered ahead of time, so folks aren't left wondering if they are doing the right thing. Enjoy your vacation! The undersigned has read and agrees to abide by the terms, rules and regulations of this Dog Addendum.